Though we've learned a lot about the Galaxy Nexus specifications already, one of the things that has remained a question thus far is whether its 4.65" 720p HD Super AMOLED display uses an RGB subpixel rendering layout or PenTile. We've now confirmed that the Galaxy Nexus display does in fact use RGBG PenTile, like all the Nexus devices to date. This isn't super surprising considering that Samsung has been pretty good about adhering to all the monikers it has gradually been tacking onto AMOLED. There are a number so far - 'super' connotes an optically bonded panel and digitizer stack, 'plus' connotes an RGB stripe, and now 'HD' connotes, well, 720p. HD Super AMOLED lacks Plus, and thus isn't an RGB stripe. The next question is just what 4.65" HD Super AMOLED will look like, or whether the presence of PenTile will be as noticeable as previous AMOLED phones like the Nexus S / Galaxy S or Nexus One where it was arguably very noticeable. That said, at some subpixel density it should become difficult to impossible to notice PenTile's presence, it's just a matter of exceeding human visual acuity. 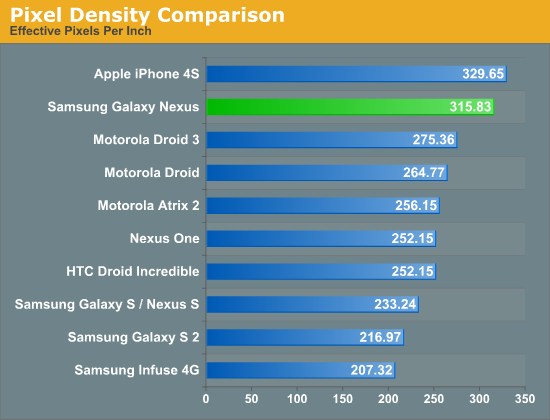 Having not seen the Galaxy Nexus in person yet and given the absence of good macro shots of the display, we have put together a numerical comparison pitting the Galaxy Nexus panel up against some other common smartphone displays. First up is a quick plot of the effective pixel density of some popular displays. 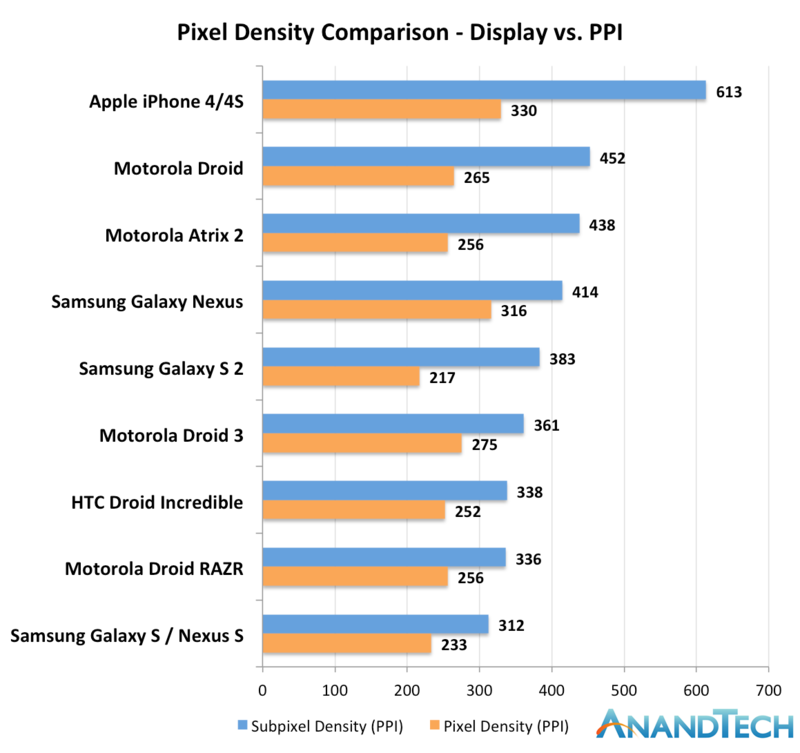 Stated another way, this is the pixel density based on the manufacturer's stated logical resolution, which is also the resolution of Android's render target for the phone. Note that this is the traditional means of reporting pixels per inch that we've published before. However, using this metric is just a bit misleading since it doesn't take into account the difference between 2 subpixel-per-pixel RGBG or RBGW PenTile versus the 3 subpixel-per-pixel RGB stripe. To make for an effective comparison, we've put together another plot where we take into account the presence of PenTile and report subpixel density. Here things still look pretty good for the 4.65" HD Super AMOLED display, putting it just north of SGS2's Super AMOLED Plus display with an RGB stripe. 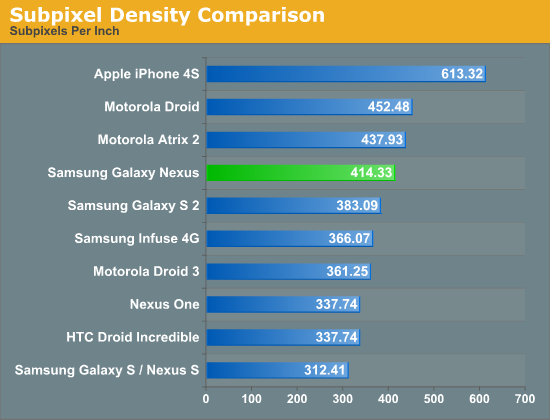 I wager that if you were satisfied with the pixel density of SGS2 that the pixel density Galaxy Nexus actually won't be off-putting despite the presence of PenTile. In addition, hopefully some of the UI design considerations that come along with using PenTile (no vertical 1 pixel thick elements) have been taken into consideration from the outset for Ice Cream Sandwich. For true subjective impressions however, we'll have to wait and see. why do we even care about these charts? What we care is the total number of pixels. Not the density. You wouldn't want a 400 PPI 320x480 display on your cell phone. Think about it. If you want a very high number of pixels per inch, just move your phone 1 meter away from your eyes. This way you won't see the pixels. You can hold a 4.65" display farther than a 3.5" display by the way. All pixel-based displays strive for their viewers to be unable to distinguish individual pixels. Different PPIs are required to achieve the effect at different distances. If I have to get 4' away from my 1080p HDTV to discern individual pixels, then that's a good thing. Most times, I will use the TV much further away, but I might walk closer. I don't want the visual quality to suddenly deteriorate if I happen to get up look at it as a I walk past the set. The same reasoning is used in mobile phones. I typically use my phone at a distance of 12-18", but the device will undoubtedly get closer to my face at some point during usage. So it comes down to usage distance and PPI. Screen size and pixel count, alone, have little influence. That's actually all we are measuring here. I just came to the realization that if you have a 3.5" screen, you probably hold your phone closer than someone who has a 4.65" screen. And as you get closer, you need more PPI to compensate. So if you wanted to do more than impress someone who holds the phone right up to their eye, and actually make small text smooth at the actual distance they hold the phone, you would have to know what that distance is. So far, I haven't seen anyone mention anywhere that vital missing piece of information. Well, kind of, but not really. The issue you raise is related to two things (a) the distance at which a persons eyesight is comfortably focused and (b) the size of UI elements on the screen. The former is more of an issue for older people or those with impaired eyesight. But you won't often see the same text size. The most consistent UI element would be the way the web browser is used. For example, displaying almost a full-page view in portrait and a full-width view in landscape. In that common scenario, the text on the 3.5" display will be much smaller than a 4.65" display, so the user will hold the 3.5" display closer, negating some of the benefit of higher pixel density. Many apps will share similar layouts and will simply adjust the text size to fit the display as well. So you should see the same thing there in most cases. You are right. Font size is not consistent across applications. However, we were not discussing font size variance across apps but across display sizes. You asked if iPhone users hold their phones closer. The answer is that they do not (given a similar text size). You will find many android devices with large displays, where the texting and e-mail applications render text at about the same size as on an iPhone. A web page that is comfortably read in full-width mode on a large android phone, will often force an iPhone user to zoom in on the are of interest and scroll/read through an article that way (a mobile browser will apply a level of magnification that attempts to render the text using a predefined font size that is comfortably read on the given display).